"Here I stand, I can do no more"
Today is the day that Martin Luther, almost 500 years ago, hammered his 95 theses to the door of the Wittenburg church. This wasn't an odd thing to do, it was sort of the public bulletin board and was used to announce debates or statements people had. Martin Luther didn't have anything magical or special in mind, he just was posting a series of complaints about the actions and policy of the Roman Catholic Church. From that, partly thanks to the new Guttenberg press, the Protestant Reformation erupted across Europe, forcing the Roman Catholic church to reform its self (eliminating some of the worst things Luther complained about) and shattering the entire system of one church rule, and eventually forming the modern concept of nation states as a result of the upheavals, in the Treaty of Westphalia. In fact, as moments in history go, there are few more incredibly momentous than Luther's trick with the door. The entire western world changed on that day, although nobody knew it at the time. Greater liberty and academic freedom resulted, an explosion of commerce, education, science, art, exploration, and more all resulted from that single catalyst, that one event that launched a world-changing movement. 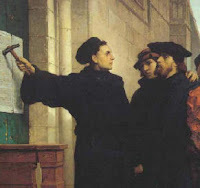 The Protestant Reformation is downplayed pretty heavily by most historians, largely because of its heavy theological content, but it was an immensely critical event in western history that resulted in what we now understand and enjoy as civilization. And we are now abandoning, in the name of comfort. But back in 1517, the world changed from a little thing by a little German monk. And yeah, there's another holiday today too, based around a Roman Catholic absorption of Samhain turned into a religious holiday and now just a masquerade. They're all a bunch of heretics. Orthodox Christianity comes closest to the word of the apostles. Catholicism and the derivative protestants teachings were all based on bad translations of the original Greek text (for the most part) into vulgate Latin. The Romans kill Christ and their spawn steal the religion from it's Judo-Hellenistic adherents. I guess in some way we should celebrate that Luther turned it back to a form closer to its original and away from the grotesquely deformed monstrosity of the Catholic church. Actually Martin Luther and John Calvin did their own translations, not based on the Vulgate. That's true. That's why the protestant interpretation is more accurate. The Catholics forbade any questioning of their mistranslations or the "Donation of Constantine".